A compound that self vulcanizes (dries) at room temperature forming as a highly elastic, strong rubber. Can be poured over skin to make your own designs or use as fun body paints. It can be also be applied to a variety of materials (fabrics, for example) for a rubber finish and endless design possibilities. Our special formulation of liquid latex has been tested directly on the skin with repeated applications since 1994 and no negative or harmful effects have been noted. 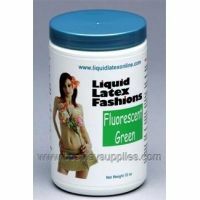 Liquid latex is not made as a permanent coating on surfaces. It will lift off the skin by itself after several hours. It will not clog the pores nor prevent perspiration from forming.